Arbor Day was first held in the small Spanish village of Villanueva de la Sierra in 1805. The U.S. recognition of Arbor Day dates back to 1874 and its founding in Nebraska as the culmination of a tree planting holiday first proposed a few year before by pioneer J. Sterling Morton. Morton and his wife loved trees and felt a day of recognition and planting important to the environment and the nation. The Arbor Day Foundation has a pictorial history in an online flipbook that tells the story in a quick and informative read on its website. Arbor Day has evolved and grown to be recognized in many countries around the world. The dates tend to vary based on local climates and suitable planting seasons. However, the theme is the same all over – Plant Trees To Make The Planet Green And Healthy. It is fitting on Arbor Day to recognize the importance of good forestry management in creating sustainability for wood products. The construction industry is vital to the economy and wood products are an integral building component for homes and buildings. Cellulose insulation, along with wood-intensive construction, offers the opportunity to create lower carbon footprint homes that can trap carbon in the walls and attics for years. The raw material for virtually all wood products come from trees. Trees create one of the most important natural carbon sequestration zones on Earth. They synthesize carbon trapping it in cells for years. When forestry harvests planted trees, the typical source for wood and paper products, the carbon continues to be trapped within the cell fibers. Reforestation or replanting of trees on marginal crop or pasture lands creates a self-sustaining supply of carbon rich raw material as well as increased sequestration. Homes and buildings insulated with cellulose insulation become mini carbon sinks like trees trapping carbon in the walls and attics for the life of the structure. 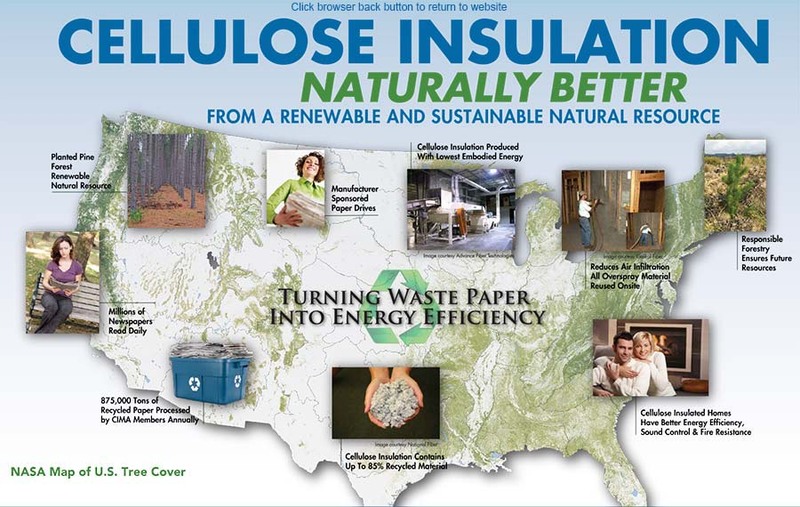 Happy Arbor Day from the Cellulose Insulation Manufacturers Association. CIMA and its producer members recognize the importance of responsible forestry and the value of Arbor Day in raising awareness for the importance of planting trees and maintaining health self-sustaining forests. This Arbor Day, consider planting a tree. And if planning a home insulation product, consider using cellulose insulation–The Greenest of the Green®. This entry was posted in Carbon Neutral Housing, Cellulose Insulation, Green Building. Bookmark the permalink.